Hilton San Francisco Union Square and Parc 55 San Francisco – A Hilton Hotel are celebrating the Lunar New Year with a special long weekender package so that guests of the city can enjoy a leisurely excursion that includes a full day at the Asian Art Museum as well as visiting some of the great sites of San Francisco, including nearby Chinatown. The long weekend is a great way to plan a relaxing journey in the City-by-the-Bay, exploring the vibrant Union Square neighborhood for shopping at the city’s largest selection of retail stores, outlets, boutiques and department stores; taking in a production at one of the many neighborhood theaters; enjoying a ride on San Francisco’s legendary Cable Car; or just drifting the streets of Union Square. In addition, both hotels are a short walk from Chinatown for guests who want to eat and shop their way through America’s largest Chinatown. The highlight of the Lunar New Year Weekender package is the opportunity to enjoy the Asian Art Museum’s special Kimono Refashioned exhibit. Featured from February 8 through May 6, 2019, Hilton San Francisco Union Square’s Lunar New Year Long Weekender package starts at only $209 per night for Friday and Saturday nights, with a 50% discount on the third night (Sunday) for a Standard King Room. Based on double occupancy, this offer is available for two people and includes accommodations as well as a discount on the Asian Art Museum’s Kimono Refashioned exhibit. The discounted tickets for the museum’s exhibit can be booked through the hotel’s concierge team. Also featured from February 8 through May 6, 2019, Parc 55 San Francisco’s Lunar New Year Long Weekender package starts at only $209 per night for Friday and Saturday nights, with a 50% discount on the third night (Sunday) for a Standard King Room. Based on double occupancy, this offer is available for two people and includes accommodations as well as a discount on the Asian Art Museum’s Kimono Refashioned exhibit. The discounted tickets for the museum’s exhibit can be booked through the hotel’s concierge team. Kimono Refashioned is a new exhibition at the Asian Art Museum that explores the impact of kimono on global fashion, from the Victorian era to the digital age. Spotlighting more than 40 ensembles, accessories and artworks from close to 30 designers and artists — including innovators like Paul Poiret, Coco Chanel, Issey Miyake and Tom Ford — Kimono Refashioned tells the story of the globally interconnected world of high fashion. On view from Feb. 8 through May 5, 2019, Kimono Refashioned reveals how the two-dimensional structure, cutting-edge textiles and decorative motifs inspired by kimono have shifted the course of contemporary fashion. Featuring apparel from the collection of the renowned Kyoto Costume Institute in Japan, Kimono Refashioned follows the influence of kimono from 19th-century English formal dresses with bustles and trains to 1920s Parisian evening gowns, to haute couture fashion in the late 20th century, to recent pop menswear. For more information, visit http://infocus.asianart.org/kimonorefashioned/. While 2019’s Lunar New Year begins on February 5, the San Francisco festival and parade is scheduled for February 23 from 5:00 – 9:00 p.m. Named one of the top ten Parades in the world by International Festivals & Events Association, the Chinese New Year Parade in San Francisco is one of the few remaining night illuminated Parades in North America and the biggest parade celebrating the lunar new year outside of Asia. With over 100 units, the parade features gorgeous floats, elaborate costumes, ferocious lions, exploding firecrackers and the new 288-foot “Gum Lung” Golden Dragon, which takes a team of over 180 men and women to carry the dragon through the streets of San Francisco. 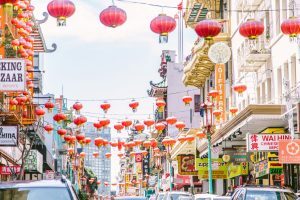 San Francisco’s Chinatown is one of the oldest and most established in North America. Beyond the iconic Dragon’s Gate, a bustling maze of streets and alleys brims with dim sum joints and other traditional eateries. Also found are herbalists, bakeries, souvenir shops and dark cocktail lounges and karaoke bars. There are ornate temples, including the landmark Tien How as well as the Chinese Historical Society of America Museum.